CMS Solutions helps you explore your objectives and options with your commercial property. We negotiate with lenders and special servicers, working towards loan restructuring solutions. CMS Solutions helps you explore your objectives and options with your commercial property. Apartment Sector fundamentals have improved steadily over the last 4 quarters. There are signs, however, that these improvements are decelerating. The question for investors is: what does this mean? Over the last 4 quarters, national vacancies have declined by 70 basis points, a faster pace than any other sector in commercial real estate. Since the peak of the recession in late 2009 of 8% vacancy, vacancies have fallen by 3.7%. IN contrast, office sector vacancies have only fallen by 60 basis points since they began to recover 5 quarters ago. 3. 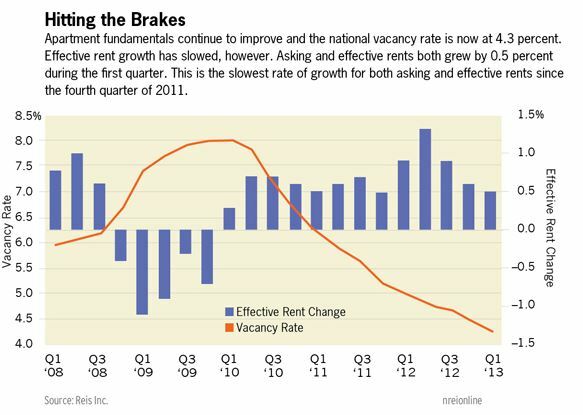 Asking and effective rents both grew by 0.5% in Q1 2013. This is the slowest pricing growth since Q4 2011. The next few quarters will test whether the Multifamily Sector can sustain continuing improvements in terms of vacancies, new absorption, and increasing rents. For landlords, these trends – which are available by sub market – will assist in forecasting operations and cash flow going forward. Excerpts taken from National Real Estate Investor, April 16, 2013; written by Brad Doremus is Senior Analyst, and Victor Calanog is head of research and economics, for New York-based research firm Reis. What Do Slowing Improvements in Fundamentals Mean for the Multifamily Sector? According to preliminary first quarter 2013 resultsfrom Reis, apartment sector fundamentals continued to improve, with vacancies dipping into the low four percent range. Asking and effective rents continued to increase, but there are some signs that improvements in fundamentals are decelerating somewhat. The national vacancy rate fell by 20 basis points in the first quarter, dipping to 4.3 percent. Over the last four quarters, national vacancies have declined by 70 basis points, a far faster pace than any other sector in commercial real estate. The vacancy rate has now fallen by 370 basis points since the cyclical peak of 8.0 percent, observed right after the recession winded down in late 2009. By contrast, office sector vacancies have only fallen by 60 basis points since fundamentals began recovering five quarters ago. The sector absorbed over 36,000 units in the first quarter, a relatively healthy rate comparable to the rise in occupied stock from one year ago (in the first quarter of 2012). Deliveries have remained modest at 13,706 units, representing roughly the same pace of inventory growth as previous first quarter periods over the last two years. Apartment landlords have another quarter or two to enjoy tight supply growth before a large number of new properties come online. Over 100,000 units are expected to enter the market, most scheduled to open their doors in the latter half of the year. With home prices recovering and mortgage rates staying low, it remains to be seen whether demand for apartments will continue to push vacancies down once inventory growth ramps up. Asking and effective rents both grew by 0.5 percent during the first quarter. This is the slowest rate of growth for both asking and effective rents since the fourth quarter of 2011; every single quarterly data point in 2012 showed stronger asking and effective rent growth versus what was observed in the current quarter. What does this mean? Optimists will point out that the first quarter tends to be weak, as most households move during the second and third quarters and bolster leasing activity and rent increases. The seasonal waxing and waning in rent growth was evident in the prior year, when the strongest periods centered around the second and third quarters. However, given how tight vacancies have become, rent growth ought to be stronger (for perspective, in prior periods when vacancies were in the low to mid 4-percent range, annual rent growth was well above 4 percent). Analysts have wondered how rents could keep climbing when jobs are being created at a sluggish rate and wage growth has been relatively stagnant: all of Reis’s major markets now boast rent levels well beyond peaks achieved prior to the recession. One answer is that the moribund housing market left households with little choice but to absorb rent hikes, but with the housing market now recovering, does that mean the tide is turning against landlords? The next few quarters will test the robustness of apartment fundamentals in the face of rising supply growth and rent levels that may have climbed to unsustainable levels. New York remained the tightest market in the country, boasting a 1.9 percent vacancy rate (vacancies declined by 20 basis points this quarter). New York is followed by eight other markets with vacancies under 3 percent; for many markets around the country, vacancies are at lows unseen in at least a decade. 67 out of 79 markets registered improvements in occupancy for the quarter. On a year over year basis, every single metro out of Reis’s 79 top markets posted increases in asking and effective rents. However, quarterly numbers reveal some potential weak points. First, Washington, D.C. registered a small but negative trend for effective rents, declining by 0.1 percent. This is the first time Reis has recorded a decline in effective rents in Washington in four years; not since the first quarter of 2009 did effective rents fall in Washington—and even then, during the worst recession in recent history, effective rents only fell for one quarter before resuming its steady march upwards. While a single quarter’s results do not necessarily imply a dismal trend, sequestration discussions are expected to impact MSAs like Washington disproportionately. The nation’s capital is also plagued by the prospect of a large number of new projects coming online this year and next, with over 3,000 units expected to open their doors in 2013 alone—the largest increase in supply growth on record in over 30 years of Reis history for the metro. Over the next 12 to 24 months what happens to Washington will be indicative of how evolving rates of demand for apartment rentals and supply of new projects determine the trajectory of fundamental variables like rents and occupancies. Brad Doremus is Senior Analyst, and Victor Calanog is head of research and economics, for New York-based research firm Reis.